When you’re sitting in the theater, all decked out in your Twilight gear, you’re going to want a snack. I mean, it’s only natural, right? Once you walk into the theater and you smell that wonderful popcorn smell filtering in from the lobby, even the strongest-willed of dieters feels a moment of weakness. 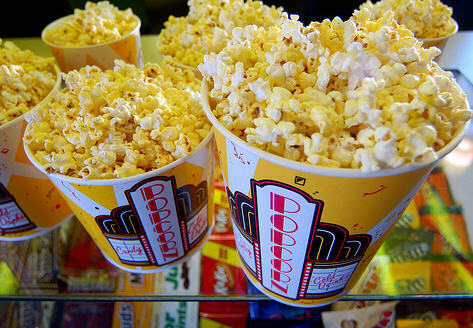 However, if you ARE a dieter, or you just care about the health of your heart, you might want to skip the popcorn. And the fizzy drink. And the pizza. Basically, don’t eat anything at the movies. This isn’t news. I mean, people have been talking about how unhealthy the giant tub of movie popcorn is for years, but to see all the nutritional information right there is just impressive. I mean, the medium popcorn bucket is 20 cups? A large soda has enough sugar in it to bake a chocolate cake? That’s an impressive amount of unhealthiness, but like everything unhealthy, movie popcorn tastes awesome. That’s why, if I’m going to succumb to the temptation, I’ll get a small popcorn and a plastic bag so I can save the rest for later/the next day. That doesn’t make it any healthier, but it does spread the unhealthiness out evenly.